It's time for another Daring Cooks challenge! This month's host was Debyi from The Healthy Vegan Kitchen. Not surprisingly, Debyi chose a recipe that is both healthy... and vegan! 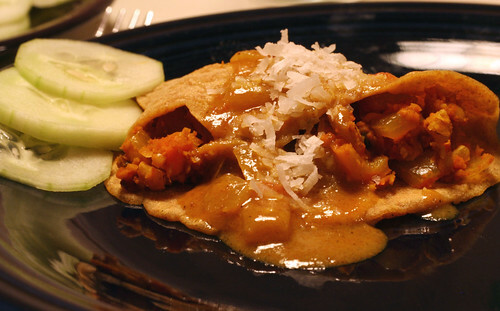 Her pick was Indian Dosas, savory pancakes wrapped around a curried veggie filling and topped with a coconut curry sauce. I'm a fan of delicious fillings wrapped in starchy packages: burritos, crepes, mu shu, calzones, blintzes, you name it. This recipe is an Indian take on that theme. Similar to last month's Daring Cooks Spanish Rice challenge, this dish has 3 distinct parts: the thin dosa pancakes, the chickpea/veggie filling, and the coconut curry sauce. Surprisingly, I didn't find this challenge too challenging. I know. It's weird. I really don't think it's because I've been getting better at cooking, though. 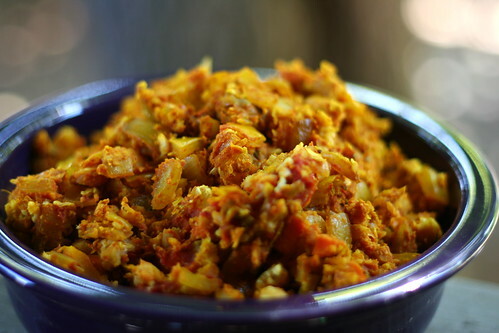 I think it's because this is a straightforward recipe, and Debyi selected it because she wanted to show us that vegan food can be approachable and delicious, which she quite successfully did. Yes, it was time-consuming, but certainly not difficult like the first few Daring Cooks challenges. Thanks to Debyi for introducing us to a tasty new meal! I made a few small adaptations: couldn't find banana peppers so I used a jalapeno, and added a bit of water several times to the filling as it cooked, since it seemed quite dry. In the sauce, I accidentally added only half of the vegetable broth. I added a bit more after the fact, but I don't think it affected the final result, and if it did, it was for the better because the sauce was divine. As always, pop on over to The Daring Kitchen if you'd like to see how all the other Daring Cooks fared this month! Debyi says: This recipe comes in 3 parts, the dosas, the filling and the sauce. It does take awhile to make, but the filling and sauce can be made ahead and frozen if need be. You can serve them as a main course with rice and veggies, or as an appetizer. 1. Combine the dry ingredients in a bowl, slowly adding the almond milk and water, whisking until smooth. 2. Heat a nonstick skillet over medium heat. Spray your pan with a thin layer of cooking spray, if needed. 3. Ladle 2 tablespoons of batter into the center of your pan in a circular motion until it is a thin, round pancake. When bubbles appear on the surface and it no longer looks wet, flip it over and cook for a few seconds. Remove from heat and repeat with remaining batter. Makes 8 pancakes. Debyi says: This filling works great as a rice bowl topping or as a wrap too, so don't be afraid to make a full batch. 1. Heat a large saucepan over medium to low heat. Add the garlic, veggies, and spices, cooking until soft, stirring occasionally. 2. Mash the chickpeas by hand, or in a food processor. Add the chickpeas and tomato paste to the saucepan, stirring until heated through. Debyi says: This makes a great sauce to just pour over rice as well. This does freeze well, but the texture will be a little different. The flavor is still the same though. 1. Heat a saucepan over medium heat, add the onion and garlic, cooking for 5 minutes, or until soft. 2. Add the spices, cooking for 1 minute more. Add the flour and cook for 1 additional minute. 3. Gradually stir in the vegetable broth to prevent lumps. Once the flour has been incorporated, add the coconut milk and tomatoes, stirring occasionally. 4. Let it simmer for half an hour. Top pancakes with filling and roll. 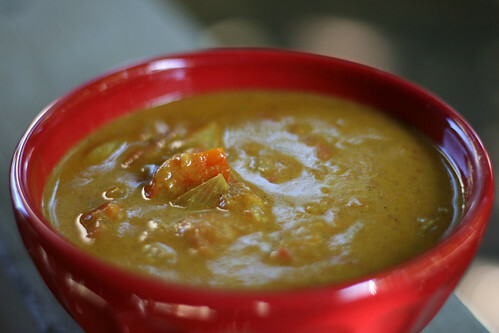 Top with coconut curry sauce, and serve with grated coconut and cucumber slices. Very nice! I didn't think the filling and sauce were bad, but those dosas were my nemesis *L* It seems like everyone else had pretty good luck with them though! I really enjoyed this recipe. As you mentioned it was time consuming, but easy to follow. I'd had issues of dryness as well with the filling. I liked how the photo of the curry sauce turned out. Your photos are lovely. It was fun to not have such a challenging challenge this time around. :) Wonderful job! great job, these look fantastic! Looking at your pictures is making me want to make this recipe again! Great job on this challenge. I'm glad you enjoyed this challenge!! Your dish looks amazing =D. Beautiful photos. Your dosas look wonderful. I hope you enjoyed them and the challenge. Oh wow, your photos make every facet of this recipe look amazing. Mine didn't turn out great flavor wise, but yours look so delicious! Well done! Beautiful pictures as always!! Actually I did not think the actual execution of this recipe was that challenging either. But it sure was tasty!